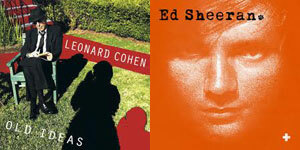 Leonard Cohen nominated for Album of the Year at the 2013 Grammy Awards? It’s unlikely, but if we had our way, the 78-year-old legend would join a young British singer-songwriter and an Icelandic pop act among the nominees. Next Wednesday, December 5, the Grammy Awards will announce their 2013 nominees. The discussion about possible Album of the Year nominees so far has centered around artists like Frank Ocean, Mumford & Sons, Pink, Maroon 5, the Black Keys, Rihanna, Florence + the Machine, Drake, Carrie Underwood and Miranda Lambert. But what about some dark horses? There are a number of deserving nominees who deserve consideration but probably won’t get it, starting with Cohen, the poet turned singer whose many accomplishments include penning “Hallelujah,” one of the greatest songs ever written. Cohen’s latest album, Old Ideas, finds the Rock & Roll Hall of Famer musing on mortality and spirituality. We’d like to think it could sneak in to the final five, but given the Recording Academy’s insistence on placing the highest-selling albums of the year there, we’re not holding our breath. The much younger Ed Sheeran, born in 1991, is another worthy candidate with his album +, featuring the worldwide hit “The A Team.” Sheeran is a long shot here, but even if he doesn’t end up in this category, he still has a strong chance to earn a Best New Artist nomination. Of Monsters and Men, a six-piece band from Iceland, are dark horses in several categories at the 2013 Grammys. Their infectious hit “Little Talks” could appear in Record or Song of the Year, but their entire album My Head is An Animal would be a worthy choice for the album award. Fellow Icelandic act (and former Grammy nominees) Sigur Ros should also be considered for Valtari. Others who deserve consideration include Passion Pit’s Gossamer, Sleigh Bells’ Reign of Terror, and Esperanza Spalding’s Radio Music Society. Will any of them get an Album of the Year nomination? Not likely, but the Grammys have surprised us before. Who would you like to see get nominated? 2013 Grammy Awards Predictions: Who Will Get Nominated?